They arrive by Twitter, by RSS, and by email. They're passed around on social networks. They’re embedded in online articles and blog posts. I’m talking about all of those links to things you'd like to read but can’t. Making time to read everything you find on the Web the moment you find it is hard, so you probably don’t read it at all—unless you use a read-it-later service like Instapaper. Instapaper makes it easy to save online articles for later reading: Just click a bookmarklet in your browser, and the story you’re looking at is saved, stripped down to just its text and essential images. You can then access your saved articles on the Instapaper website or using the Instapaper apps for iPhone and iPad. If you’ve never heard of Instapaper, here are a few tips on how to get started. If you’re already an Instapaper fan, I’ve also got some ideas about using it efficiently. If you don’t already have an Instapaper account, go to the Instapaper site, click on Create an Account, and sign up. (You just supply an email address and password.) That done, you’re ready to start saving articles. It’s so easy to do so in a variety of contexts. In the Settings pane, you can set up Mail, Safari, and other apps to store Instapaper links. On the Mac. Sign in to your Instapaper account online and go to the Extras page, then drag the Read Later bookmarklet from there up to your OS X browser’s bookmarks bar. One other option on the Mac: the popular RSS client NetNewsWire ( ) has its own Send to Instapaper button. From iOS apps. 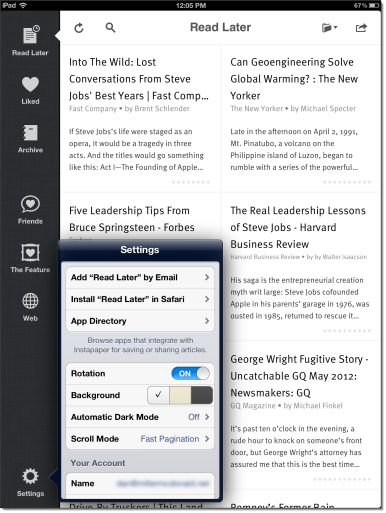 Instapaper is integrated into a number of apps where you’re likely to encounter new articles. For example, my favorite RSS reader for iOS, Reeder ( ) lets me save articles I’m interested in to Instapaper with a couple of taps. My Twitter app of choice, Tweetbot ( ), does the same. So do Flipboard ( ), Twitter ( ), Twitterific ( ), and Instacast ( ), to name a few more. You'll find these apps listed on that Extras page or by tapping Settings in the iOS app (at the bottom-left of the app’s main screen) and then tapping App Directory. From email. You can email URLs to Instapaper. To do so, go back to that Extras page. There, you’ll find your unique Read Later email address. Send a message to that address, with a URL in the body, and the content of that webpage will be saved to your Instapaper account. I recommend adding that address to your address book for ease of access. If you’re using Instapaper for iPhone or iPad, go to the app’s Settings and tap Add Read Later by Email. Any URLs you email to that address will show up in your Read Later folder. Worried about saving multi-page articles? Don’t be. Instapaper automatically merges multi-page articles into a single, continous article. There are actually three ways to access your saved articles: pointing a browser to the Instapaper website; syncing Instapaper with your Kindle account; and using the Instapaper apps for iPhone and iPad. Of those three, reading Instapaper on my iPad is my favorite. When you launch the iPhone and iPad apps, they automatically download new articles that you’ve saved. The articles then stay on your device so they’re available even when you’re offline. And the new iPad’s high-resolution Retina display makes reading Instapaper’s beautiful fonts a true pleasure. The easiest way to rid your Read Later folder of articles you've read is to archive or delete them. In iOS, archiving or deleting can be done with a simple swipe and a tap. If you archive an article, it can be found in (you guessed it) your Archive folder. If you delete it, it’s gone. Tap Friends in the sidebar to configure your social-networking accounts, so you can share stories you've read. When you read something interesting, you might want to share it with others. Instapaper lets you post articles to Twitter, Facebook, Tumblr, Pinboard, and Evernote. In the iOS app, tap the Friends button in the left-hand sidebar, tap Accounts, and add your credentials for whichever accounts you want to link. Once you’ve linked an account or two, you can share stories with them by tapping the Send To button (the one with the arrow) and selecting Share. That will summon a Share pane in which you can select the service you want to share to. From that Share pane, you also have the options of emailing or copying the link or text of the story. It also enables you to turn the article into an item in other apps. Depending on which apps you have installed, your options could include turning stories into tasks in Omnifocus or Things (perhaps to remind yourself to create blog posts) or into notes in Simplenote. If you particularly admire a story you've read and want to be able to find it later, mark that story as Liked by clicking the heart icon next to it at the Instapaper website or at the top of the iOS app’s screen. To go back to the stories you’ve liked, tap the Liked icon in the main screen’s sidebar. 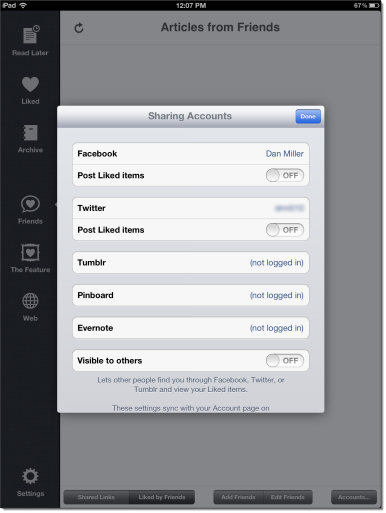 The iOS app can be configured to automatically post liked articles to the social-network accounts you’ve linked. Other Instapaper users can find you and see your liked articles via Twitter, Facebook, or Tumblr—if you’ve linked those accounts. Instapaper’s basic functionality—collecting articles for later reading and tidying them up for easier reading—is pretty straightforward. But there are two tools that can make the service much more powerful. Folders. By default all saved articles land in your Read Later folder. But you can create folders of your own, too, and those folders can serve a variety of purposes. For example, you could create folders for specific projects or purposes. I’ve used folders to temporarily store Cliffs Notes pages for books I’ve read. You might want to make folders that organize articles by length (long-form vs short ones). Or maintain folders according to where you want to view the content they contain—articles with videos that you’d rather watch on your Mac than on the iPhone, say. You could even set up a “greatest hits” folder for articles so good you want to revisit them once in a while. Because each Instapaper folder has its own RSS feed, so you could use a folder as a way to build a custom feed, which could be published on your website. Articles can be sent directly to folders by adding folder-specific bookmarklets to your Web browser; each folder’s bookmarklet is found on the right side of the folder’s page at Instapaper.com. Search. Instapaper isn’t really meant to be a long-term content storage facility. But if you’re like me, at some point, you’ll want to track down an article you’ve archived. There are several ways to do that. The easiest option is to become a paid Instapaper subscriber. While virtually all of the benefits of Instapaper are completely free, full account search is available to those who purchase a subscription (currently $1 per month). If you aren’t interested in subscribing, there are two other ways to search your Instapaper content: First, you could export your archived articles as a CSV file using the Export CSV option at Instapaper.com. The resulting comma-separated file will contain article titles and URLs, which are searchable in a text-editor. The second approach utilizes Pinboard, my favorite bookmarking service. In your Instapaper account settings, you link your Instapaper and Pinboard accounts. Once you do that, any article you star in Instapaper will be automatically added to Pinboard as a bookmark, making it easy to find later using Pinboard’s search field. My preferred approach is to enter the URL for the RSS feed of any Instapaper folder in my Pinboard board account settings. I have Pinboard set up to bookmark every single article I archive in Instapaper. This effectively makes Instapaper a front-end service for capturing any article I encounter that makes any sort of impression on me. As long as I can remember any piece of the article’s title, I know I can find it later. I don’t know anyone who doesn’t use the Internet—and I don’t know anyone who uses the Internet who doesn’t read articles there. That’s why I recommend Instapaper to everyone. When you gain control over the experience of reading on the web, you read more, and you read it whenever and wherever you want. Eddie Smith (@eddie_smith) is an actuary who writes about Apple technology, productivity, personal improvement, and more at his blog, Practically Efficient.